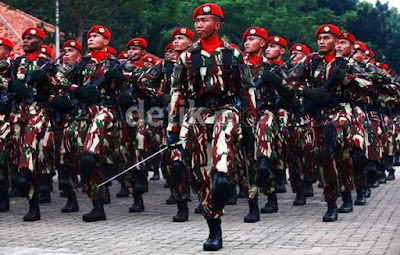 The history of the birth of the Special Forces Command as the unit can not be separated from the historic circuit in the life of the nation of Indonesia, in July 1950, raised a rebellion in Maluku by a group calling itself the RMS (Republik Maluku Selatan). 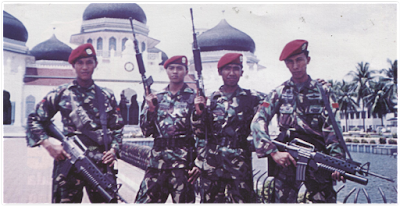 The Armed Forces of Indonesia when it was immediately deploying troops to quell the mob. This operation led by Army Commander Colonel Territory III A.E. Kawilarang, while as an appointed Operations Commander Lt. Col. Slamet Riyadi. The operation is able to crush the insurgency, but the victim is not small on the part of the military. After a review turns in several battles, the enemy with a relatively smaller force is often able to thwart the military attack whose strength is much greater. This was not only due to the spirit of members of enemy forces higher or equipment that is more complete, but also tactical and combat experience that is well supported right firepower and movement of individuals. 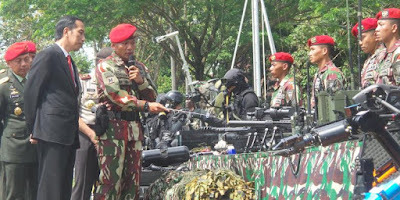 These events ultimately inspired Lt. Col. Slamet Riyadi to spearhead the formation of a beater units that can be moved quickly and appropriately to deal with various targets in terrain which, however weight. However ideals Lt. Col. Slamet Riyadi impossible to establish because he was killed in one battle. These lofty ideals followed by Colonel A.E Kawilarang. Through instruction and Territorial Army Commander III No. 55 / Inst / PDS / 52 dated 16 April 1952 formed UNITY OF COMMAND III territory which is the forerunner of "Corps of the Red Berets". As the first commander entrusted to Major Mochammad Idjon Djanbi, a former captain who've joined the Colonial Army Corps Special Troopen and had fought in World War II. 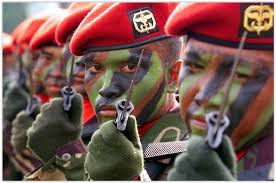 Pataka the Special Forces', Tribunal Chandraca Satya Dharma' Symbols or images contained in Pataka Special Forces emblem worn together with each member in the beret. 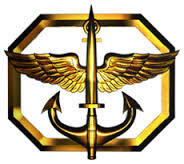 At first emblem was designed by Lt. Inf Dodo Sukanto 1955 as a bureau officer who is assisted by an interpreter Teaching Sergeant Hasan picture. Emblem combines elements Command (commando knife picture), the element of the sea or water (depicted in the form of anchor) and air (pictured pair of wings) framed by the chain of command. In 1964, the badge downsized by placing a commando knife picture on the front, but the images and mark in principle unchanged. 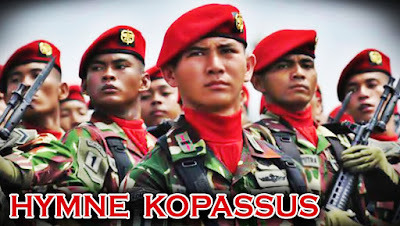 Emblem that is used until today as seen in the emblem berets and in Pataka Kopassus. Meaning of sesanti, Tribunal Chandraca Satya Dharma: a. The service activities or Three Universe: 1) As a servant of God who created human beings as the most perfect creature then in his personal consists of three elements, namely creativity, taste and intention to be actualized as real work. 2) As a warrior should be able to take part in three dimensions, namely land, sea and air. b. Chandraca: 1) As a powerful weapon trident shaped and used only in the last moments of the battle. 2) a potent weapon in the form of small illustrates that the Special Forces putting ability over the number and are used for tasks that strategic value. 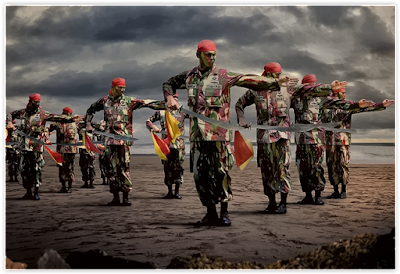 c. SATYA DHARMA: loyalty and dedication as the integral nature of the virtues of soldiers who imbued Sapta Marga and the Soldier's Oath.